One of the stars of London 2012, with 3 gold medals (200m, 4x100m, 4x400m), Allyson Felix is determined to make history in Rio, and become just the third woman to do the 200-400m double at the same Olympics. 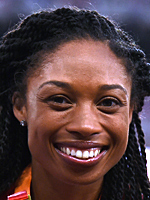 The American had to wait nearly a decade to get her hands on 200m Olympic gold, after being forced to settle for silver behind Jamaica's Veronica Campbell-Brown in 2004 and 2008. She finally managed it in London, becoming the first American woman since 1988 to win 3 golds in athletics. The 30-year-old also boasts 9 world championship titles, including 3 in the 200m (2005, 2007, 2009) and 1 in the 400m (2015). She looks well-placed to add to her impressive medal haul in Rio.